The D-Tech library self-service kiosks have become a familiar service in libraries all over the world. Self service kiosks eliminate queues, allow for libraries to open 24/7 and free up library staff time to help customers. 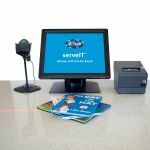 Both the hardware and self service kiosk software is developed, designed and manufactured by D-Tech (UK) to provide a reliable, easy to operate and manage solution, compliant with current data standards. D-Tech SelfCheck units are available for RFID, EM, or Barcode only systems. Integrates with a libraries software to securely store, charge and issue up to 96 laptops, tablets or devices via SIP2 connection.